Previous Thinking About World War 2 Next Happy My Anniversary! This is a very interesting subject and you are a very wise person in how you handled this difficulty. I thank you for teaching us about the bow protocol and I too very proud of our president for being astute and sensitive to other cultures. Hi, Toni. Thanks for visiting my blog and reading my blog entry. I didn’t know that the picture that your president is bowing to our Enpreror and Enpress is kind of contravertial picture after I heard the story from my American friend. I am glad that you accept our culture and understand our culture. I found this entry very interesting.I neve thought in this before.Thank you. Hi, Marsiol. Thanks for the comment. I am glad that you like the entry and enjoyed reading it! 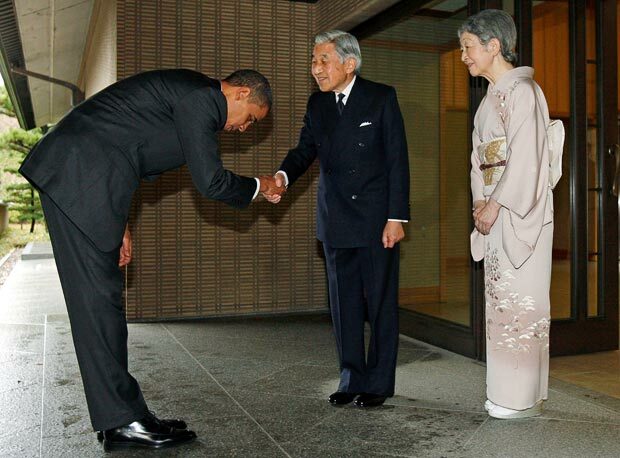 i remember when President Obama bowed to the Emperor of Japan. Many conservative people in America were angry at President Obama for bowing. They felt he showed weakness by bowing. There are a lot of dumb people in America that don’t understand Japanese culture. I think the bow is the greatest greeting in the world. It shows even if you have the most powerful job in the world, like the U.S. president, you can still show great humility to others by bowing. Hi, Matt. Thanks for the comment. Thank you so much for teaching me not only English but also American culture every time we chat. I also appreciate you gave me a chance to write about it on my blog. Did you check out my voice message? I am sorry it isn’t a good one to choose as a tpic, but I am very interested in the article. So, I would love to discuss it tomorrow. I hope you get it and check it out. I am really looking forward to talking to you tomorrow about it! Thanks for the comment, Daisy. I’m glad that I could post an interestning blog entry for you! Hi, nia. Thanks for the comment. Yeah, most of Western people don’t know about bows’ degrees. Actually, the topic was very interesting. I have a good American friend. He always gives me good ideas and hints for my blog. I’m happy you learned something from my this blog entry!